The design team at Idearich has brought over two thousand projects from conception to reality in the past twenty years. It was a bit of a crazy idea when we decided to make our first cat table in 2011. 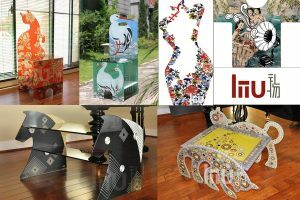 We have adopted many stray cats at our company since 1998, so when we decided to venture into the field of glass furniture, it made perfect sense to use cats as our major source of inspiration. We bring a holistic new design sensibility to each article of glass furniture, in both form and function. Instead of starting with traditional compositions and trying to make them look fresh, our designers bring every piece to life using a simple structure with charming and colorful patterns. Susan Lee is a fourth generation student of Kinichiro Ishikawa, the Father of Taiwanese Art, in Taiwan. She is the founder of Idearich and Liiu. Susan is also a visual consultant for Global Views Magazine (Taiwan’s premiere business magazine) and a strategic consultant for the Taipei Glass Commercial Association. She will be showing her work in the Kinichiro Ishikawa museum in Japan.